Let Them Be Kids: Asphodel-Norwood: Thank you Hydro One Inc! Kent Trolley from Hydro One Inc. stopped by to personally deliver a cheque for $5000 from the Hydro One PowerPlay Program on Tuesday! Stacy accepted the cheque on behalf of the Township for the proposal she had written. 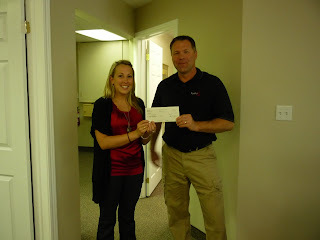 Thanks again for your generosity Hydro One Inc.! !